Those of you with an interest in all things melodic and speedy will probably be aware of the much loved/hated Dragonforce's recent UK tour and rising power metallers Sabaton's position as main support for the whole jaunt. 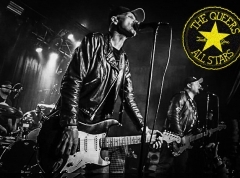 By all accounts the plucky Swedes have been giving the Guitar Heroes one hell of a run for their money and undoubtedly gaining the shed-load of new fans that only a spot on a major tour can really achieve. Not being inclined to shell out for a show at my local cavernous venue given my lack of interest in the 'Force these days, the announcement of a Sabaton headlining date in London was most welcomed. So it was that I found myself queuing outside The Garage on a cold December night with quite a number of friends and acquaintances, eagerly awaiting the opening of the doors - although admittedly my eagerness had more to do with a trip to the toilets than the music at that particular point! Half an hour after doors, which gave plenty of time to discover the beer prices were as high as anywhere else in London, Reading metallers Malefice hit the stage. It has to be said that the support line-up was notable mainly for the fact the styles of metal on offer were at odds with the power metal of the headliners - none more so than the metalcore/death/thrash of Malefice. While this probably put a fair amount of people off turning up early, I was interested in checking these guys out given their signing to Metal Blade and rising stature in the metal world. I had in fact seen Malefice live once before, but as that was in a pub in Guildford, both my intoxication level and the quality of sound on that night meant my impression of the band was somewhat vague. Surrounded by the theatrical smoke that filled the whole venue (making achieving a decent photo with my basic camera rather difficult), Malefice launched into something typically heavy - although I'm afraid my lack of familiarity with their recorded output means I have no idea which particular tracks they played (suffice to say I'm sure there were a fair few from this year's "Dawn Of Reprisal" album). 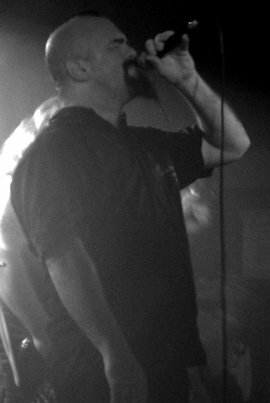 It quickly became clear that frontman Dale Butler was the main focal point of the performance, conveying a natural confidence that lead the band through their half hour set. Despite sticking to a one-foot-on-the-monitor stance for most of the duration, he still had good stage presence - which was slightly lacking from the rest of the band in comparison. Admittedly the room on stage was limited with their drum kit in front of Sabaton's, but there was still scope for a lot more movement and, well, passion. Maybe it was playing for an audience which had the potential to be hostile, as videos of other performances show the band to be a lot more energetic, but I feel they missed an opportunity to really go for it and impress a new audience. 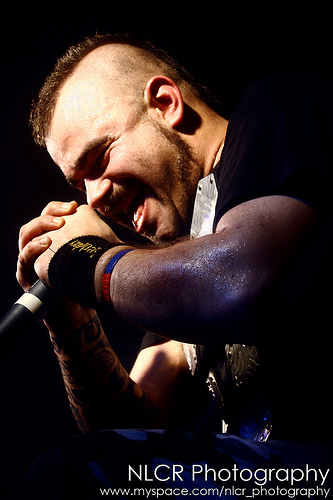 Quite often, and especially with 'br00tal' type bands, the macho frontman will bark out an order to the audience, something along the lines of "I wanna see you go crazy/a mosh pit/chaos out there!" which, whilst commendable from an enthusiasm point of view, is pretty cringe-worthy when delivered to a small and/or apathetic audience. So to his credit, Butler avoided this cliché and instead asked for those enjoying the music to at least nod their heads - a much more realistic request and one which made me warm to the band's efforts, along with his general down-to-earth nature. At this point you might be thinking Malefice were playing to an empty venue, but far from it. Whilst the cold weather probably helped in getting people inside to watch, a fair number of those nearer the front were clearly enjoying the set. A bit of headbanging here, some moshing there and plenty of clapping after each song showed that many appreciated Malefice despite their polar difference to Sabaton. I must admit I'm not a fan of whatevercore, so the overall sound of the band wasn't quite my thing, but the more pure death and thrash metal influences were generally to my liking, along with their melodic touches. Their sound was both heavy and extreme, the kind of thing designed to start moshpits, but also fairly indistinct. Given this applies to most bands of a similar style it's not something that is likely to hold these guys back. I doubt any fans would have been blown away by their performance, but it was solid enough stuff for those with a penchant for the heavy 'core-infused side of things and I'm sure we'll be seeing a lot more from these guys in the future. Panic Cell are a band whose name popped up regularly on bills around the UK a few years ago, but one which I somehow managed to never see live until this gig. For some reason I had the idea that their sound was thrash/extreme-based but I must have been getting them confused with another band, as they turned out to play heavy, groovy metal/rock. Being, as singer Luke Bell put it, "fat bastards", the imposing frontman started their set standing in the photo pit, which whilst giving him more room to manoeuvre, probably had some of the crowd a bit miffed as to why they couldn't see much of him. Once again I can't tell you the names of any songs, but they had the kind of heavy riffs that are easy to nod along to and occupy the middle ground between old-school and modern. Admittedly none of these stuck im my memory after they had finished and there was a tendency for them to become background music rather than grabbing my attention, but the band performed with enough conviction to make them enjoyable. 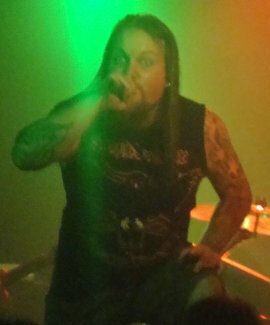 Frontman Bell, eventually clambering onto the stage, had a strong voice that brought to mind the tone of latter-era/recent Hetfield and the crooning side of Zakk Wylde but with added melodic ability and less of a 'twang'. for that performance demonstrates just how entertaining they can be, considering he felt their music was "homogenous and uninspiring". I think it's a safe bet to say no-one at this show shared that view, as the anticipation rose and chants of 'SA-BA-TON' erupted. 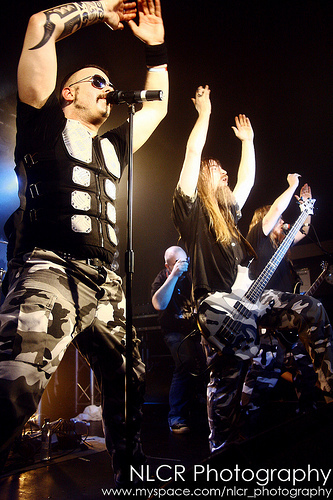 When the band did take to the stage, led by one of power metal's true showmen in Joakim Broden, they wasted no time in whipping the crowd into a frenzy with the energetic "Ghost Division". Indeed, such was the audience response to the song that Broden informed us we were louder than his on-stage monitors during the chorus, something he had never experienced before! This highlights nicely the enthusiasm Sabaton inspire in their fans and not surprisingly this helps lift their gigs up a notch or two regardless of what's happening on stage. This was followed by three cuts from latest album "The Art of War", which invoked just as strong a reaction from the crowd and had the Swedes grinning from ear to ear as they showed why they're so highly praised; moving around the stage, headbanging, starting chants and just generally feeding off of the audience's energy. Of course a great live show is nothing without great songs and as the set progressed it dawned on me just how many of these Sabaton have. From start to finish there was barely a note that could be described as less than excellent and the live environment showed their songs to be much more potent than on record. 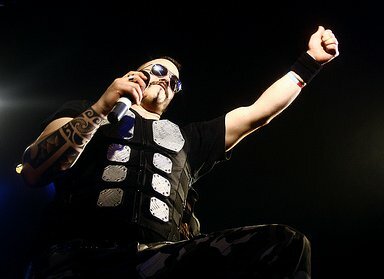 For those of you not in the know, Sabaton have something of a theme running through most of their work - war. Almost all their songs are about some aspect relating to various wars, from particular battles of WWI and II to Vietnam, the Falklands and the current war in Iraq (Broden pointed out his 'Help For Heroes' wristband at one point, encouraging the audience to support the troops). This, along with the distinctive vocals of Broden sets them apart from a lot of bands in the genre. As the band continued further into their set - which included an apparently rare airing of "Back In Control", sending a number of people crazy with glee - one thing became clear; that these were guys coming to the end of a fairly intensive tour with Dragonforce. Apart from the indefatigable Broden, you could tell the band were feeling the effects of a month of little sleep and (one would assume) excess alcohol, with a similar look to metalheads returning from a festival. That's not to say they were looking unhappy, far from it (especially bassist Par Sundstrom, who had a perpetually smiley face like that of Iron Maiden's Dave Murray), but the energy levels weren't quite as high as previous performances. The sense of fun the band exudes never disappeared though, with antics to raise a smile ranging from guitarist Rikard Sunden almost tripping Broden up, to banter from the frontman regarding them being a 'very gay band'. With such strong songs throughout it's hard to pick highlights, but I've always had a soft spot for "Panzer Battalion" as it was the first Sabaton song I heard. The epic "Light in the Black", while being a less 'obvious' track, as it were, also came across really well. After lots of chanting of their name, it was time for the encore and the traditional closing medley of "Metal Machine/Metal Crue", two songs with lyrics made up of references to metal bands and albums. Closing a great set that saw more clapping and singing along than any other gig I've been to this year, Broden said "seriously London, you've given us an absolutely fantastic Sunday, thank you so much!" with a massive smile and look of slight disbelief on his face at the huge crowd reaction. With plans for a new album next year it wouldn't surprise me to see Sabaton playing the slightly bigger Islington Academy when they make their glorious return.